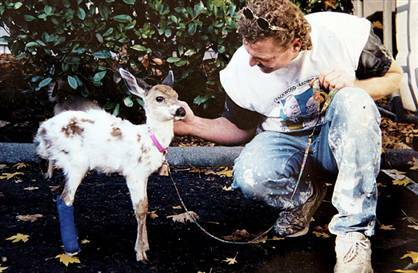 Snowball is a tame pet deer that the Oregon fish and game has seized for the owner not having a permit to keep her. I also live in Oregon and the laws here to keep, raise and breed wild animals are pretty lax. I personally know a local woman that had a permit to breed and raise snow leopards and indeed she had them. So why did they take Snowball? Probably becasue they could and it was a slow day at the office. Last I heard was that they were going to release Snowball's son into the wild, right at the peak of hunting season. Bucky (her son) is also tame. Where are these people's minds at – on vacation, hunting perhaps? 6 Responses to "The plight of Snowball the deer"
We also have deer pass through our property every morning. I also dread this coming weekend – the begining of hunting season. I have horses and I am always worried about them getting hit by a hunters bullet. We also have heard poutchers (sp?) in the area last year, hunting at 4 am in the morning when it is dark, that is illegal. I can’t believe they would force tame deer to be released during hunting season. I love deer and we have plenty of them that pass through our woods. My husband and I have been tempted to leave them treats and to try to get closer to them. We discourage them from hanging around or trusting us because we don’t want them to trust any trespassing hunters. As much as we’d like to be friends with deer, it would put them in danger. This was writen by my Boyfriend who is serving in Iraq…. i just want to take a moment to comment how relieved i am that snowball the deer was returned to its family. In between kicking iraqi children, and opressing the clearly innocent iraq local citizens, most of us have been following the Snowball the deer story and battle very closely. When we heard that Snowball the deer was captured by the evil government empire who is hell bent on causing war and raising taxes (and rumors of cutting health care!! *eeekkk*), we all over here in Iraq were very worried. After all, Princess Snowball knew the location of the seceret rebel alliance base. However, once the rebels obtained the plans of the local Clackmas Death Star where Snowball was being imprisioned (cell block D “royal prisoners ward”), an all out attack could be launched to rescue Princess Snowball before the evil government empire could do unspeakable horror to the Princess. That horror being something so evil its hard to say or type it. But being a brave soldier i am, i will say it. The empire was actually going to release Snowball into the wild!! (Lord forgive me for saying that.) And we all know wild animals do not belong in the wild, they need to be under our care and protection. So with the Clackmas Death Star plans in hand, and led by Judge Eve Miller with the newest x-wing fighters, the empire had not a chance in hippi hell of keeping the beloved Snowball. I was rolling on the floor with your comment – too funny. Don’t hold your breath on the Snowball sage, I heard that Fish and Game plans on more legal manuvers before Snowball can be returned. Thank You I will past it on to him. I wish I could take the credit for writing it. But that all goes to my Boyfriend. I have been recording Heros for him and he saw one of the news breaks and asked me about it. He wrote that last night.